The 3MV-1 series were soviet Venus probes carrying a landing capsule. The spacecraft consisted of a fly-by probe and a 90 cm spherical landing capsule, containing experiments for chemical analysis of the atmosphere, gamma-ray measurements of surface rocks, a photometer, temperature and pressure gauges, and a motion/rocking sensor in case it landed in a liquid. The first probe (3MV-1 #1) was launched on 27 March 1964, but was left in an earth orbit, when the upper stage of the launch vehicle failed. It was designated Kosmos 27. 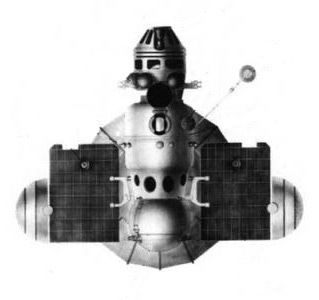 Zond 1 (3MV-1 #2), the second probe in the series, was launched on 2 April 1964 from Baikonur. The probe failed during cruise phase, when a slow leak from a cracked sensor window caused the spacecraft to depressurize. An ground command turned on the radio system while there was still a rarefied atmosphere inside, causing the electronics to short out by corona discharge. Nevertheless, communication was maintained via the transmitter in the landing capsule, so that space radiation and atomic-hydrogen spectrometer measurements could be performed. By May 14 1964, finally all communications failed. Zond 1 passed 100,000 km from Venus on 14 July 1964. It was the second Soviet research spacecraft to reach the planet.